Actually really officially finally finished the Blue Phoenix. 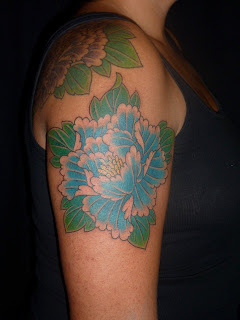 I thought we were just going to add the eye and a small peony bud on the shoulder, but we ended up doing a full size peony on the arm to complete the look. I'm really happy that she wanted that there and stoked on the tattoo as a whole. It's been a fun year doing this one. It's strange seeing someone so often on a regular schedule and then all of a sudden being done.